Wisconsin Metal Tech, a metal machining company located in Richfield, WI celebrates 25 years of business. In the last 15 years the company has added two 8,000 square ft. additions to keep up with growing business demands, and with a backlog that has doubled over the last three months, plans are underway for yet another expansion. What I find most rewarding is that we are able to assess our customers' current state and find ways to improve their business and make their lives easier. Wisconsin Metal Tech, a metal machining company located in Richfield, WI celebrates 25 years of business. Proprietor Jeff Heinze has dedicated himself to assisting customers in the metals industry and has seen tremendous growth in his 25 years of owning and operating Wisconsin Metal Tech. In the last 15 years the company has added two 8,000 square ft. additions to keep up with growing business demands, and with a backlog that has doubled over the last three months, plans are underway for yet another expansion. 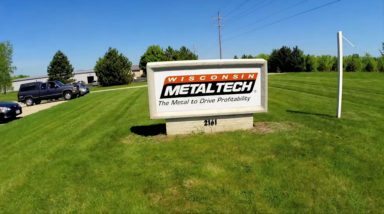 Founded in 1992, Wisconsin Metal Tech began their venture into the manufacturing industry by bridging the gap between material vendors and potential customers. By 1994 the industry began to see a great deal of consolidation and buyers were dropping out of the business. Heinze realized that the company needed to grow and saw his first opportunity to expand by offering saw-cut materials to his loyal customer base. By 1998 Wisconsin Metal Tech built their first building in Richfield, WI. The initial structure, totaling to 6,000 square ft., was used as a space to sell and saw-cut parts for customers. In 2002, they expanded, adding the first 8,000 square ft. addition. This new addition gave Wisconsin Metal Tech the ability to offer centerless grinding and bar grinding services in addition to saw-cutting parts for its customers. By 2007, Wisconsin Metal Tech expanded its capabilities even further by adding two CNC machines and rotary bending services. In 2013, the second 8,000 square foot addition was added to keep up with the increasing workload. Wisconsin Metal Tech has made a name for themselves in the metals manufacturing industry by consistently meeting their customers’ needs, and doing so in a timely manner. Their expanding business means they are looking to hire two more machinists to continue driving the productivity they are known for. Their increasing customer base can be attributed to the combined efforts of their new industry veteran outside salesman, existing customers referring their colleagues, and new digital marketing efforts. Wisconsin Metal Tech, located in Richfield, Wisconsin, is a full-service contract CNC metal machining, centerless grinding and material supply company. Wisconsin Metal Tech serves original equipment manufacturers and contract part and assembly providers across the Midwest, nationwide and the world.